Calling all Da Vinci Design Alumni! 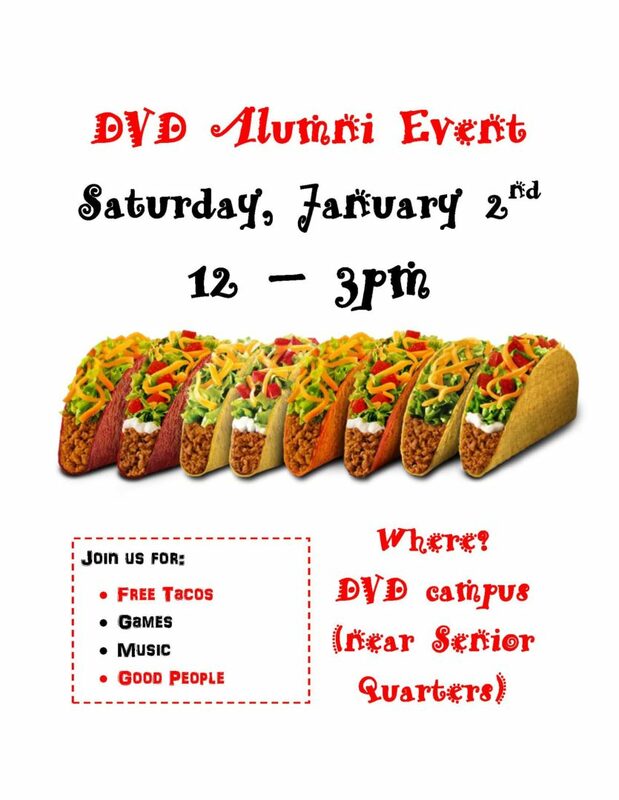 The annual DVD alumni gathering will be taking place this Saturday 1/2 from 12:00-3:00 for any Da Vinci Design alumni at the back of campus. Free tacos for lunch will be provided. We look forward to seeing you awesome alumni there! Please be on the lookout for mailed report cards this week and please review the following images for more information about next semester. We hope you have an amazing holiday break with your families and friends! Thank you for all of your support this semester. Designers – Congratulations on finishing Semester 1 POLs! This post is a friendly reminder that tomorrow is the last day of semester 1! We are running a normal school day from 9:00-3:55. You will see each of your classes plus advisory and CD at the end of the day. 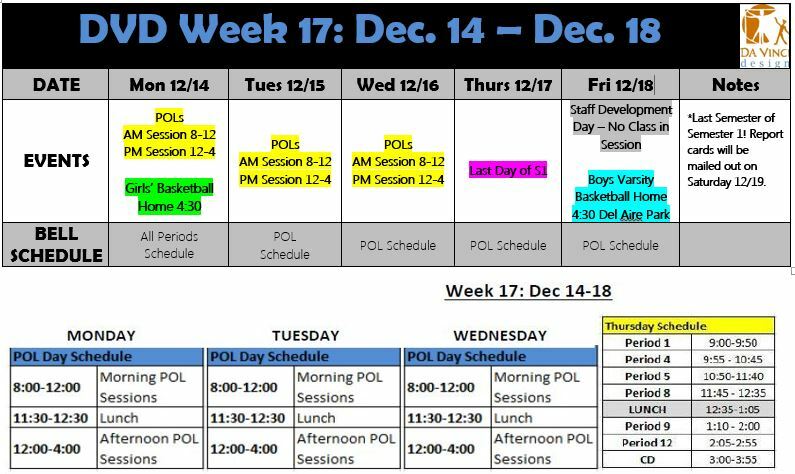 There is no school on Friday 12/18 as it is a staff development day for teachers. 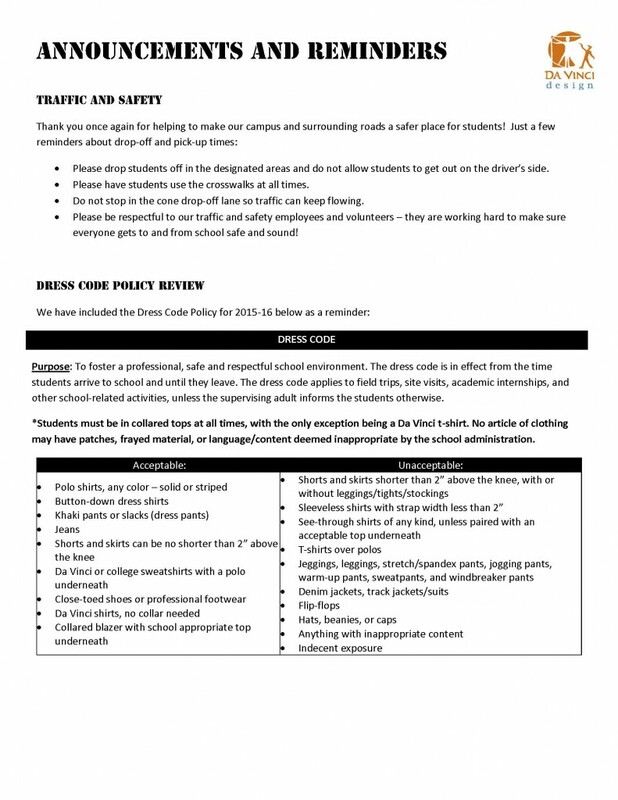 Report cards will be sent out Saturday 12/19; please allow at least 2-3 business days for delivery. Seniors…don’t forget to match your Naviance Family Connection and Common App accounts! See your College Counselor before the winter break with any questions! Because there has been no threat made to DV or Wiseburn, we will hold school today as we normally do unless directed to do otherwise. We will keep you posted. 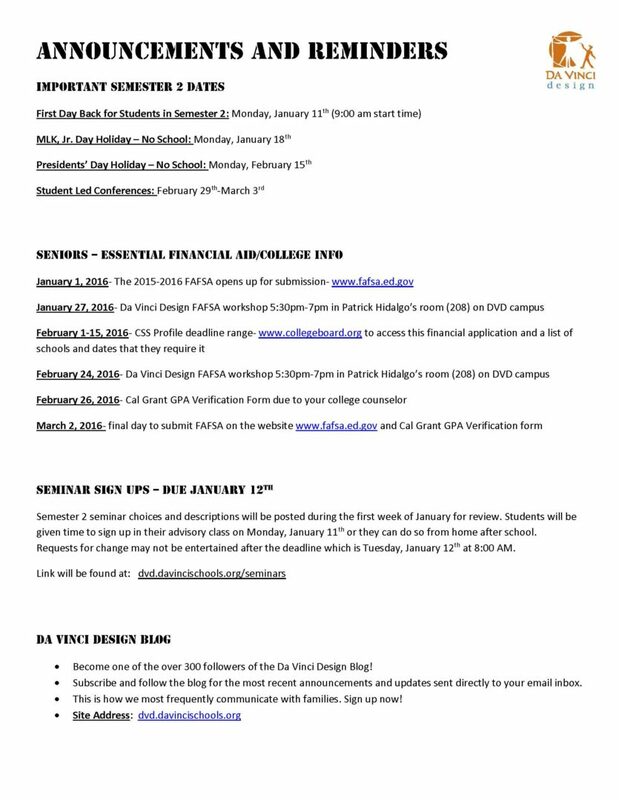 Designers – can you believe next week is the last week of first semester? Congratulations on your first week of POLs being complete; only 3 more POL days to go! Next Thursday is the last day of Semester 1 and we will be running a normal 9-3:55 schedule. No class on Friday 12/18. 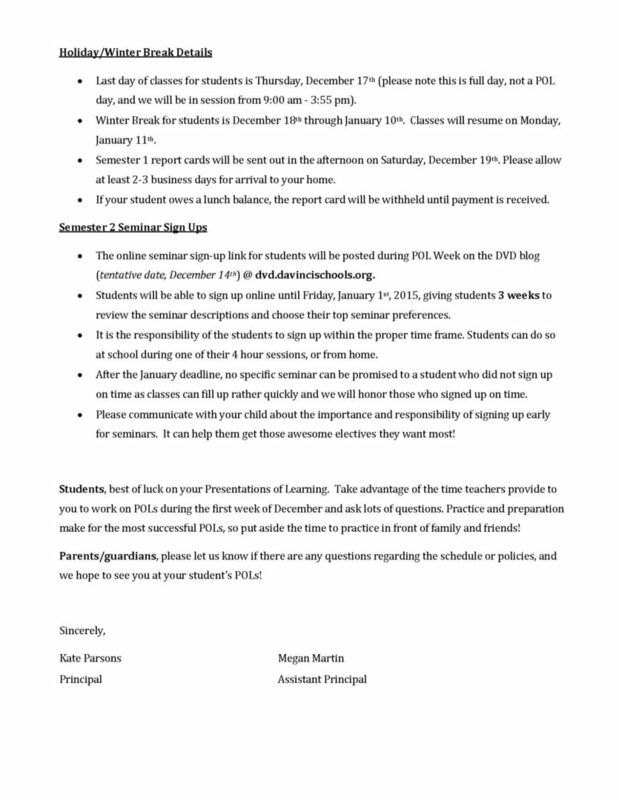 Report cards will be sent out Saturday 12/19. 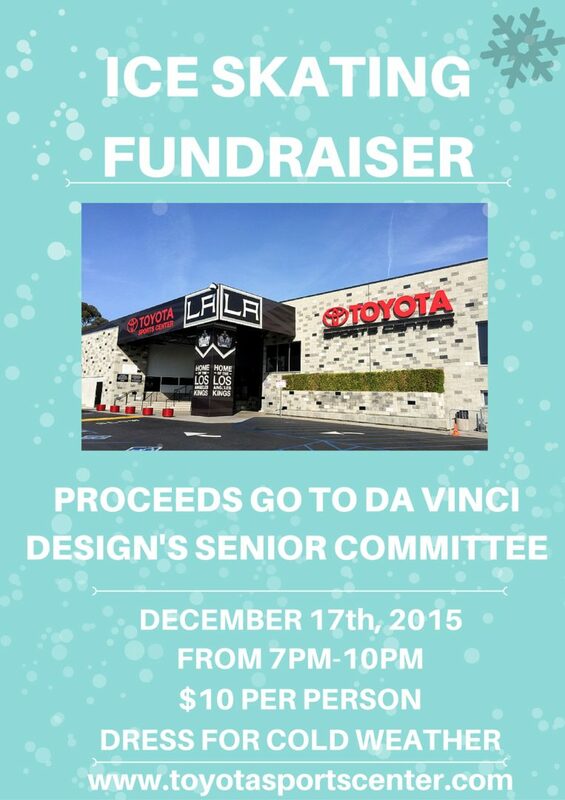 Don’t forget about the Ice Skating fundraiser which is being run by Senior Committee on December 17th from 7-10 pm at Toyota Sports Center. See flyer on the last post for more details! Beginning tomorrow, tickets will be on sale during lunch. They will also be on sale at the door on the night of the event. We hope to see you there! Buy your Yearbook Now! Price increase after Friday Dec. 11th! 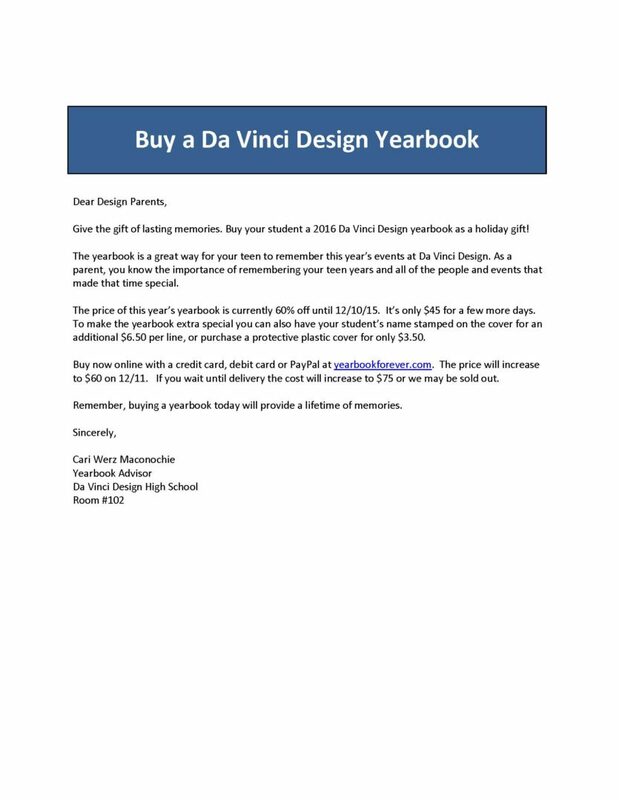 Designers – buy your yearbook before December 11th for the lowest price, $45! Prices increase after that date. You can purchase yearbooks online with a credit card, debit card, or PayPal at yearbookforever.com (search for Da Vinci Design). POLs Start Tomorrow! Info and Reminders! Designers, POLs and the half-day schedule begin tomorrow. 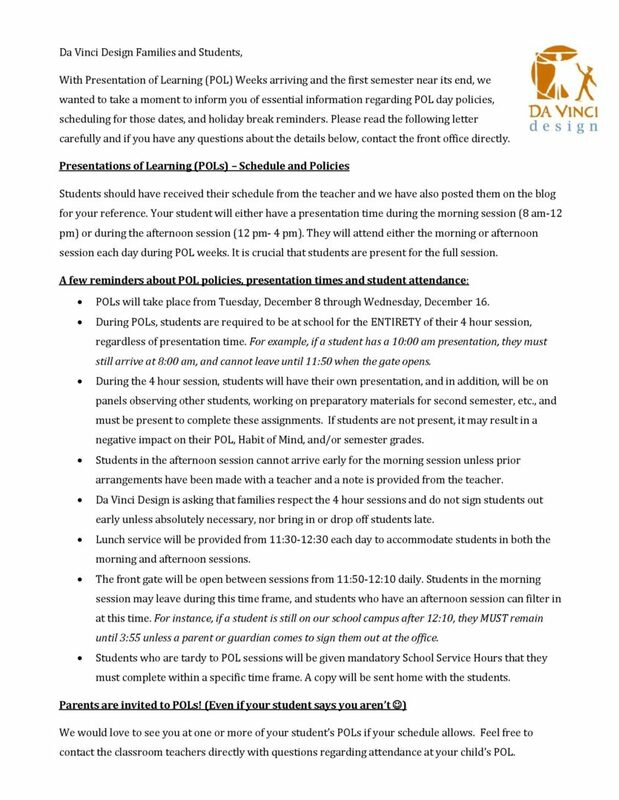 Please see the letter below for more details on POLs and some important end-of-semester dates. SENIORS…have you “officially” sent your SAT/ACT scores? FOR UCs ONLY: if you applied to multiple UC campuses, you only need to send it to 1 campus you applied to! The UCs will then share it with all UC schools you applied to. See your counselor before the Winter Break with any questions!